Your stage of life and the needs of household members will in part dictate your ideal bathroom design. A bathroom for a family with young kids may look very different to one designed for a couple planning to age in place. Just like your family evolves over time, your home design must adapt to fit your stage of life, and a bathroom is no exception. Entry: make sure you can easily enter the bathroom by including a wider than normal doorway to facilitate access. A lever handle can also be easier on the hands than a traditional doorknob. Bathing Options: when mobility is a priority, opt for a shower over a bath. 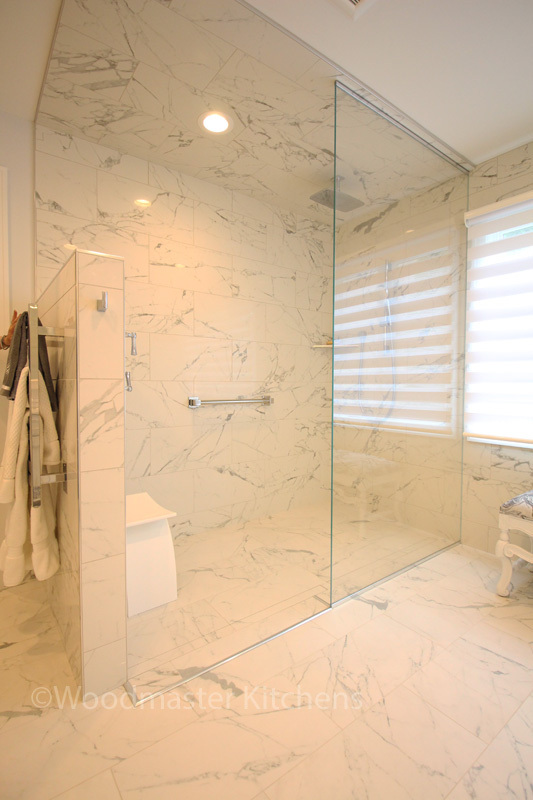 The best solution is a large, curbless shower or even an open shower style, both of which also happen to top the list of bathroom design trends. Multiple showerheads, including a handheld option, make bathing much easier. Add a built-in shower seat so you have a comfortable place to rest. Don’t forget to include built-in storage at a comfortable height to make shower toiletries easily accessible. Toilet: the toilet is a necessary part of every bathroom, but not all toilets are the same. As you age, sitting and standing becomes more difficult, so a standard toilet height can be tricky. Comfort-height toilets sit 2-3” higher than standard models, and are specifically designed to make it easier to get on and off the seat. This makes a huge difference to the privacy and comfort of an individual with limited mobility. Sink/Vanity: vanities and sinks can be installed a varying heights to suit the people who will be using the space, particularly with a freestanding vanity. You may also consider a multi-level vanity, perhaps with sinks at different levels. A freestanding or make-up vanity could simplify using the facilities in a wheelchair. Remember to place mirrors at the correct height for people who will be using them. Also, incorporate built-in storage such as pull out shelves that allow you to easily find your toiletries and other items. Floor: bathrooms are notorious for attracting moisture and dirt, making them a potentially hazardous environment full of slippery surfaces. Carefully select your flooring material and design to minimize the risk of accidents. Textured tiles or vinyl, among other surfaces, are ideal choices to create a more slip resistant bathroom floor. Lighting: lighting should be a key consideration in any bathroom design, but it is particularly important when planning for aging in your home. Include adequate lighting so you can easily see and move safely through the room, but avoid glare that comes with relying only on overhead lights. Use sconces around the mirror or where possible incorporate natural light from a window. Night lights or toe kick lights make it easier to see when getting up during the night. Rails and Grab Bars: a shower rail and grab bars in other key locations can easily be added and make the bathroom much safer to use. These items are no longer limited to institutional looking styles and finishes, but can be found in an array of options to fit in with any design. Check out more accessible bathroom design ideas in our gallery pages here, or contact us to get started in designing your ideal bathroom.